Cation Exchange Capacity - What is CEC & How Does It Impact Soil Fertility? Why is it that turf doesn’t grow well on a sandy beach? Why do some soils leach nutrients more so than others? What are the characteristics of a ‘fertile’ soil versus a ‘nutrient-deficient’ soil? These questions are directly related to a term that is often mentioned in the turf and soil sciences, but not well understood by many in the industry. In this feature, we’ll examine what cation exchange capacity is, and the direct impact is has on soil fertility and overall plant health. With a greater understanding of CEC, you’ll be able to understand what’s going on in your soils and how to fix or enhance them should they need adjusting. CEC 4 – It’s no secret that turfgrass doesn’t grow well in sand. Why is this? What characteristics of sand make plant growth difficult? What effect does sand have on CEC? Strictly by definition, CEC is a measure of how many cations can be retained on soil particle surfaces. In other words, some soils are good at holding water and nutrients in place, while others are poor. In order to understand how CEC works, we need to go back in time and briefly review some basic high school chemistry concepts. In nature, many elements and ions have either a positive or negative charge. Just as with electromagnets, opposites attract. Take for example table salt (sodium chloride, or NaCl). In nature, a sodium (Na) atom has a positive charge of +1, and a chlorine (Cl) atom has a negative charge of -1. When the two elements interact, they form an ionic bond and the two charges neutralize each other, meaning the net charge of NaCl is 0. This is important because most macro and micronutrients plant's needs aren’t delivered in their pure elemental form; they are delivered in ion form and are derived from ionic compounds. For example, plants need potassium (K), but we don’t spread pure potassium on the ground because pure potassium is highly reactive in its elemental form. Instead, we spread muriate of potash (MOP) which has a chemical formula of KCl (otherwise written K+ Cl-). Much in the way table salt dissolves in water into Na+ and Cl- ions, when MOP is spread onto turf, water eventually splits up the K+ and Cl- ions. Once the K+ ions are dissolved, they quickly find negatively charged soil particles and temporarily stick to them until plant roots find and take up the K+ ions. While there are many other factors at work (presence of other ions in the soil, soil pH, etc. ), this is the basis for how plant nutrient uptake works. CEC 5 – The diagram below shows how sodium and chlorine ions (NaCl, table salt) are normally bound together tightly into a crystal, however when water is added, the Na+1 and Cl-1 ions split apart. A similar reaction takes place in the soil with macro and micronutrient raw ingredients in the presence of water. Once ionic compounds split apart into ions with positive and negative charges, they can find soil particles and ‘stick’ to them while maintaining their ion forms. Most fertilizer micronutrients, as well as a few macronutrients, have a positive charge of +1 or +2. An ion that has a positive charge is called a ‘cation.’ Conversely, an ion that has a negative charge called an ‘anion.’ When fertilizer cations fail to stick to negatively charged soil particles and wash out of the root zone, it’s called ‘leaching.’ When this happens, fertilizer inputs are unfortunately wasted. How are cations quantified in soil samples? Now that we understand that all nutrients are taken up by plants in ion form (and not pure elemental form), we can better understand the concept behind CEC. Remember, CEC is the measure of how many cations can be retained on soil particle surfaces. Naturally, in order to determine the CEC of a soil, we would collect a soil sample and then use a laboratory method for precipitating (or ‘shaking loose and collecting’) all the cations that are stuck to the soil. Remember, nature tries to create stable systems, meaning nature doesn’t prefer ions with positive or negative charges lingering in a high energy state. This means, in order to shake the cations out of a soil sample, we must displace (or replace) our nutrient cations with different cations. Four commonly used laboratory reagents capable of performing this ‘cation exchange’ reaction are ammonium chloride, sodium acetate, ammonium acetate and barium chloride. (When you read a soil test report, it may indicate which testing reagent (or method) was used to determine the CEC.) Soil pH is the primary factor for determining which reagent is used. Once the reagent is selected, the solution is reacted with the soil sample. The amount of known testing reagent absorbed by the soil is calculated. This value can then be used to calculate the total amount of cations exchanged (or precipitated) by the soil. Chart 1- The chart below shows a listing of the most common macro and micro nutrients and associated nutrient ions forms that exist in the soil (that plants can actually absorb). The presence of all cations in the soil (even ones not listed in this chart) can be used to help determine the total CEC value of a soil. Also note that many ions have a negative charge (-1, -2 or -3). These ‘anion’ nutrients cannot be detected using a cation exchange capacity test. Instead, one would have to perform an ‘anion exchange capacity’ test (AEC), which most laboratories do not perform (this is because most macro and micronutrient ions are cations). What is a “CEC value” and what does that number actually mean? CEC is measured in “millequivalents per 100 grams of soil” (units reported as = meq/100g). This value represents the number of cations the soil can hold in terms of the total number of electrical charges the soil can hold. For example, a single hydrogen ion (also called a ‘proton’) has a charge of +1 (H+1), but a single calcium ion has a charge of +2 (Ca+2). Let’s say we have a negatively charged soil particle that can only hold 2 positive charges (remember, opposites attract). That means our soil particle can either hold one calcium ion with a +2 charge, or two hydrogen ions (each with a +1 charge). Either way, the total CEC value of the soil will be the same because the soil only has room to hold two positive charges. In summary, the higher the CEC value, the more positive charges the soil can hold. In other words, soils with higher CEC values can hold more cation nutrients, therefore higher CEC values are generally more desirable. What are typical CEC values for various types of soils? CEC values of soils and soil components can range anywhere from virtually 0 to above 400, however most soils capable of supporting turfgrass and/or agronomic crops will fall somewhere between 5 and 50. Soils with lots of organic matter generally hold significantly more cations than soils with mostly inorganic matter. More organic matter generally leads to higher CEC values. ‘More’ smaller particles per unit area generally hold more cations than ‘fewer’ larger particles per the same unit area. For example, sand, silt and clay are all made of the same material. Sand particles are the largest, followed by silt particles, and then clay. Clay particles are microscopic and can generally hold significantly more cations than silt or sand, therefore sandy soils generally have low CEC values, and clay soils generally have much higher CEC values. Chart 2 - The chart below shows the typical range of CEC values for various soil types under neutral pH. 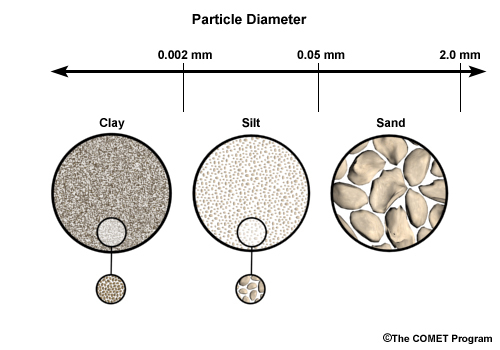 CEC 3 - (below) - Smaller soil particles (such as clay) generally adsorb more cation nutrients than larger particles (such as sand) because the total surface area of smaller particles is greater than the total surface area of larger particles when two samples of the same mass are packed into the same volume. CEC1 – (below) – Remember, nutrients exist in the soil as cations and anions. Some soils do a much better job retaining nutrient cations than others. In general, clay can hold more cation nutrients per unit area than a sandy loam. What CEC values are ideal for growing turfgrass? There are many varieties of turfgrasses, all of which have adapted to survive and thrive in a variety of soil types and climates. The one thing all turfgrasses have in common is the physiological need to absorb macro and micronutrients from the soil. While there is no ‘perfect’ CEC value that fits every turfgrass variety, climate, and soil type, soil CEC values typically range between 12-25 for most well-performing turfgrasses. Soils with CEC values below 12 are generally considered to be poor at holding cation nutrients. Soils with CEC values of less than 5 are considered extremely poor; these soils will struggle to support turfgrass, let alone other plant life. Soils with CEC values below 5 also struggle to hold water, leading to drought stress in plants that attempt to grow under such harsh conditions. Soils with CEC values above 25 are generally considered “excellent’ at holding nutrients in place; these soils do not usually require a liming application. I performed a soil test and I now know my soil’s CEC value. What are your recommendations for growing healthy, vibrant turfgrass based on my results? Overall, it looks like your soil is in pretty good shape. CEC values in this range are typical of most soils that support turfgrass growth. If your CEC values are in the bottom half of this range, you may want to consider supplementing organic matter into your soils. Lower CEC values generally indicate higher silt and sand content. Lower CEC values may also suggest your pH may need a minor adjustment, so a lime application might be recommended (if the soil is slightly acidic). Soils with lower CEC values usually benefit from more frequent fertilizer applications (this is because fertilizer doesn’t hold in the soil as efficiently as soils with higher CEC values). Be sure to have a soil test done with a complete nutrient analysis for further recommendations. Most soils with a CEC value below 12 need some help, either through soil enrichment using a variety of soil amendments, or increased applications of fertilizer, or both. These soils are typically high in sand and silt, and/or suffering from a deficiency in organic matter. Low CEC soils suffer from significant nutrient leaching in the presence of significant rain events or high water tables. Unfortunately, lower CEC values translate into wasted fertilizer inputs. For example, a sandy beach might have a CEC value of 3 or 4, meaning virtually no fertilizer will adsorb to sand granules in the root zone; nearly all of it will dissolve and wash away. Practical Example: When new homes and buildings are constructed, organically poor soil is often brought to the surface. Attempting to seed or sod lawns atop poor soil is often met with disastrous results. If encountering this situation, make sure to top dress ‘construction zone’ soil with at least 6 inches of organically rich topsoil before seeding or sodding. This will significantly raise the soil’s CEC value and lead to faster rooting and better turf establishment. What organic components can I add to the soil to raise my CEC value? Organic materials have an incredible capacity to bind cation nutrients, as well as anion nutrients. If your soil consists mostly of sand or silt with very little organic matter (less than 2%), consider adding these components to the soil. If possible, till these components into the top 6 inches of soil. Before adding these substances, make sure to perform a soil test to assess the pH. Ensure that any soil amendments added don’t shift the pH too radically such that the soil is no longer compatible with the variety of turfgrass you wish to grow. Once additional organic material has been added, perform one last soil test to recheck the pH. You can always raise the pH with gypsum / lime, or lower the pH with sulfur as needed. CEC2 – (above) Humic and fulvic acids are forms of highly biodegraded organic matter that do an excellent job chelating (grabbing and temporarily holding) micronutrients in the soil. These organic substances have extremely high CEC values and can be used to enhance the water and nutrient holding capacity of soils with low CEC values. Cation Exchange Capacity (CEC) is a powerful datapoint on a soil test. This single number tells us a lot about a soil’s ability to hold water and nutrients. It’s also a good indicator of what to expect in terms of a soil’s structure. A full soil test breaks down nutrient deficiencies one nutrient at a time and typically gives nutrient application recommendations. Understanding what CEC is and why it is important is the foundation for being able to read and interpret the results of a full soil test. In a future installment of Turf Report, we’ll dive into how to read and interpret the results from a full soil test. Meanwhile, let’s get our soils conditioned so that they hold fertilizer more effectively and maximize turf health! For more information on Soil Amendments, check out our AMP-XC™ Product page! For ordering information, check out our Product Catalog!